I bought this polka-dot top at the 50% Off Saturday sale at Goodwill without trying it on, and it doesn’t make the cut after all. I kinda like it, and I still don’t feel great in it — I was pulling at it all day because it’s not quite long enough. Maybe if it didn’t have the shirred bottom and were longer and I could tuck it in, I dunno. It was worth $2 for one wearing, though, I’m ok with that. July 24, 2010. Tags: clothes, Goodwill, polka-dot, What I Wore to Work Today. Pictures, What I Wore to Work Today, Words. Leave a comment. 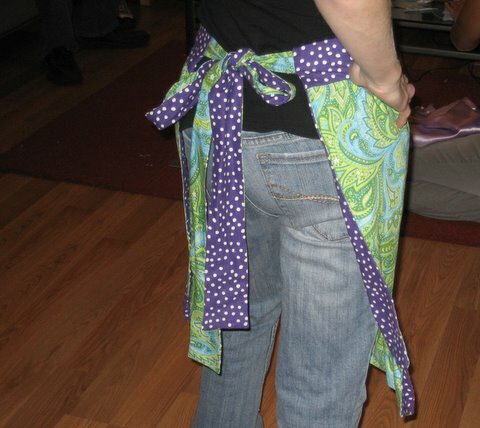 Here’s an apron I made last November for a friend. She commissioned an apron and I ended up giving it to her as a gift instead of taking her money. As usual it’s reversible. The paisley fabric was included in a Crazy Mom Quilts quilt last winter, and it was fun to recognize the material. AmandaJean makes amazing quilt after amazing quilt, and seeing that she chose the same fabric I did was reflected validation. July 25, 2009. 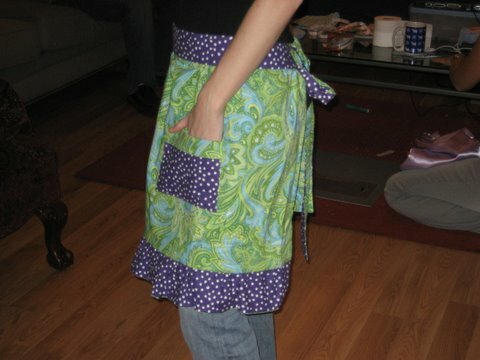 Tags: apron, completed project, paisley, polka-dot. Links, Pictures, Projects, Words. Leave a comment.